Piper Show breeches bring you everything you love about Piper breeches, designed for the show ring. This style features a modern front zip design with more traditional styling, including no back pockets for a more classic look and tonal suede details on the back belt loops and front pockets for just the right amount of Piper fun. Of course, the fabric still gives you the four-way stretch you need to perform your best, but it’s lighter than the original Piper fabric so it can help keep you comfortable when you’re working your hardest. They also have a 2” wide, contoured waistband that eliminates unseemly gapping, a flattering Euro seat, and a modest low-rise design that hits just below the belly button. Plus, the knee patches are made out of Clarino™, a synthetic, suede-like material designed to give you the right amount of grip and stretch that you need to get those blue ribbons. 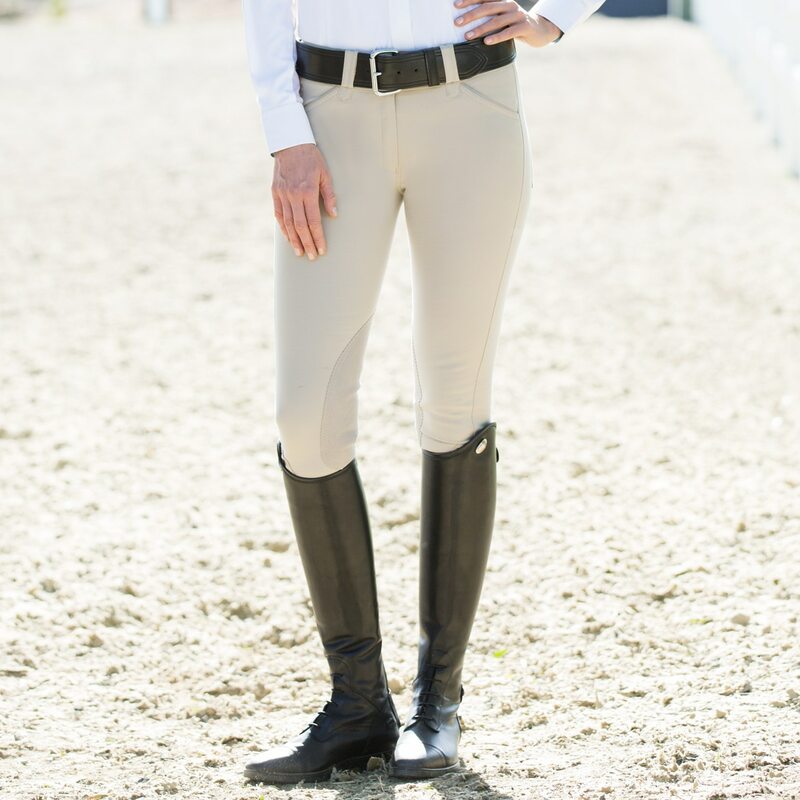 Like all of the Piper breeches, they boast our customer-favorite ergonomic calf panels, so you don’t have to worry about bulky Velcro closures under your boots. Last but not least, they’re machine washable to make post-show clean up a little easier on you. 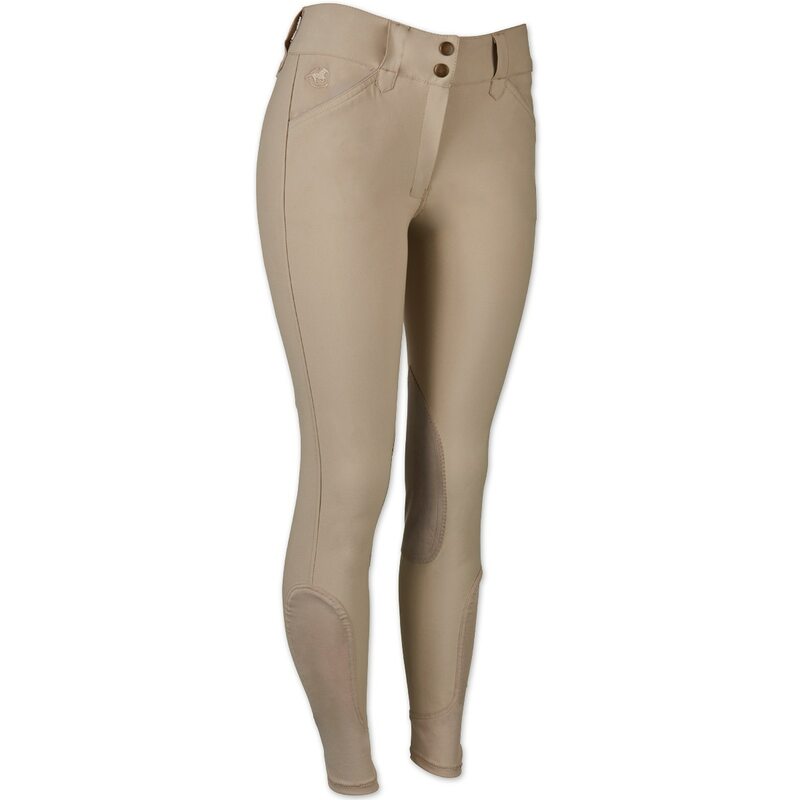 Piper Breeches by SmartPak - Show Front Zip Knee Patch is rated 4.8 out of 5 by 16. Rated 5 out of 5 by Caitlin from Comfort, Style, and Superior Fit! I am getting back into the show ring after an approximately 10 year hiatus. I remember beeches being difficult to fit and unflattering. What a pleasant surprise when these arrived and I tried them on! They are very flattering, and fit true to the measurements in the size chart. I love the mid-rise and the wider waistband, both of which prevent the dreaded muffin top. They provide firm support while still being incredibly comfortable and easy to move in. I especially love that there is no Velcro at the calf to pinch or chafe under my field boots. I am very happy with these breeches and will purchase again! Rated 5 out of 5 by Kelly from The Only Breeches She'll Wear My daughter wears these to school and to show. These are the only breeches she'll wear now! I love that they come in long sizes and aren't pricey. Rated 5 out of 5 by bmahoney from Exceptional breeches - and a great price! I bought these just recently as I needed another nice pair of show breeches. My favorite breeches to show in are Tailored Sportsman, but those come with a fairly high price tag. I opted for these during a promotion and holy buckets they are great! I don't own any other Piper breeches but I will definitely be buying more now. These style of breeches fit me great. The material feels substantial, but like they won't be too hot on very warm days. They are true to size (I'm 5'5'' and wear a 28R in every breech I've every bought, including these). These hit me just below my belly button so I would consider them a true mid rise (right in between too low and too high). Can't wait to wear these in the show ring!! Rated 4 out of 5 by Lauren from Awkward fit They look really nice and the fabric is great but they fit kinda weird. They’re very straight. They’re too big on the waist, fit fine on my thighs, then are way too big in my knees, then fit fine on my calves. Rated 5 out of 5 by sophia from Perfect in every way! When I first ordered these, they were completely out of stock- and now that I have a pair myself- I can see why. I sit here on my computer writing this review in these breeches that I just opened and tried on- that's how comfortable they are. There are stretchy and will fit wonderfully in my boots, not bulky. They were shipped to me so quickly and arrived just in time for my show. Now I have not actually ridden in these yet, but just from sitting in them right now, I think they really feel nice and will perform well. My only concern is how long they will last and if they last a long time, I will definitely buy more pairs. Quick note: You should definitely measure along your inseam (from your crotch along the inside of your leg to the ankle) to make sure you are getting the best fit possible! Rated 5 out of 5 by CodyMom from The saddle size indicates the length!! I bought regular breeches and they felt too tight over the knees. I called in to SmartPak and the nice helper told me to consider a long. I am not tall, but I have a 17" saddle. It made the most incredible difference! LOVE THESE BREECHES!! Rated 5 out of 5 by aqha6137 from FAVORITE SHOW BREECHES EVER I have always loved the original front zip schooling knee patch breeches and I was soooo excited to find that they have show ones now. These are a great color for showing and look fantastic. They fit true to size, exactly like my other Piper's! Such good quality!!! These are such a great buy for a great price. Highly reccommend. Rated 5 out of 5 by Southernpaints from Love these breeches! Bought these for shows and love them. They are comfy and look very nice in the show ring. The price is also pretty nice. I also enjoy the sock bottom and front pockets. Would definitely recommend to anyone! Rated 5 out of 5 by indiemusicgirl from Nice Show Breech These are of the same great quality all Piper products are. I found them to be longer in the leg than other Piper breeches though. I had to take them to be hemmed. The fit is nice, but a little different than other Piper breeches, a longer rise. Rated 3 out of 5 by Lisa from Fit was way off I have a pair of Piper Breeches in a size 26, and while the waist fit perfectly, the thighs and calves were REALLY tight. When ordering this particular type of Piper Breeches, I went up a size to 28, thinking that I would like the extra bit of room in my legs. Unfortunately the waist was way too big, even with a belt it bunched in the back, and the legs weren't any less tight than the size 26. Disappointed, but luckily Smartpak has the best return policy anywhere and I'll be able to return hassle-free. I would still recommend these breeches because they are very nice and felt great, the sizing just doesn't work for my body type.